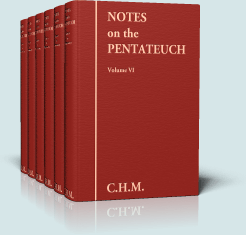 Notes on the Pentateuch (Commentary on Genesis through Deuteronomy), by Charles H. Mackintosh (1820-1896) was signed simply "C.H.M." by its author. It was originally published in six volumes from 1880 to 1882 and is Mackintosh's most renowned work. His commentary on the Pentateuch is mostly devotional in nature and finds the Creator, Jesus Christ, in every book. Mackintosh believed that the glory of Christ shone through each passage. Mackintosh's commentary is chapter-based, due to being more devotional than expository. 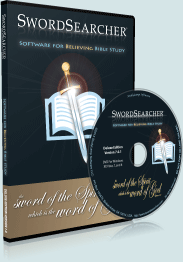 In the SwordSearcher module, the text for each chapter on which he commented appears on verse one. As with all material in SwordSearcher, the Mackintosh commentary can be instantly searched for words, phrases, or verse reference. "There is something peculiarly striking in the manner in which the Holy Ghost opens this sublime book. He introduces us, at once, to God, in the essential fullness of His Being, and the solitariness of His acting. All prefatory matter is omitted. It is to God we are brought. We hear Him, as it were, breaking earth's silence, and shining in upon earth's darkness, for the purpose of developing a sphere in which He might display His eternal power and Godhead. "There is nothing here on which idle curiosity may feed — nothing on which the poor, human mind may speculate. There is the sublimity and reality of DIVINE TRUTH, in its moral power to act on the heart, and on the understanding. It could never come within the range of the Spirit of God to gratify idle curiosity, by the presentation of curious theories. Geologists may explore the bowels of the earth, and draw forth from thence materials from which to add to, and, in some instances, to contradict, the divine record. They may speculate upon fossil remains; but the disciple hangs, with sacred delight, over the page of inspiration. He reads, believes, and worships. In this spirit may we pursue our study of the profound book which now lies open before us. May we know what it is to "enquire in the temple." May our investigations of the precious contents of holy scripture be ever prosecuted in the true spirit of worship." Opening commentary on Genesis chapter 1.